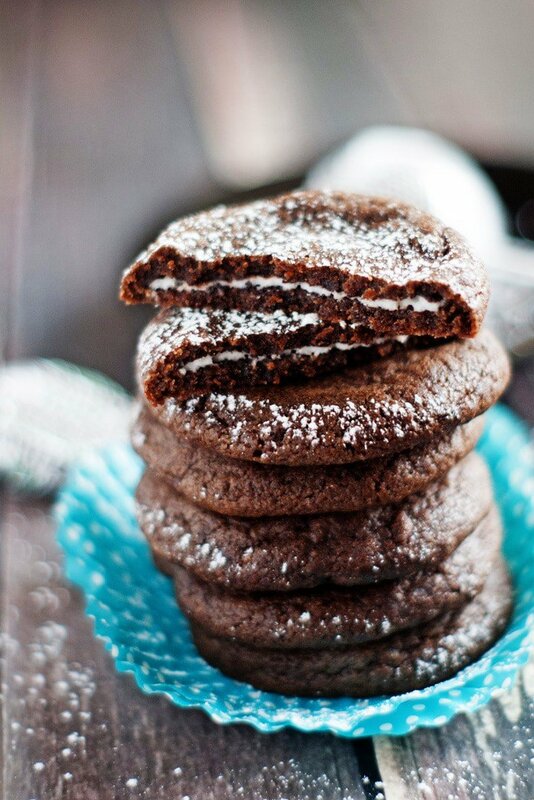 These Peppermint Patty Stuffed Chocolate Cookies won’t last long this holiday season! Who doesn’t love a rich chocolate cookie stuffed with a cool peppermint patty? Perfect for dunking in a cold glass of milk or hot cup of cocoa. Have you emerged from your turkey coma yet? We’re a good 5 days past turkey day so I hope you’ve been able to make a full recovery by now. Today I’m sharing a pretty stellar cookie recipe that will be the talk of your goodie plates this year. 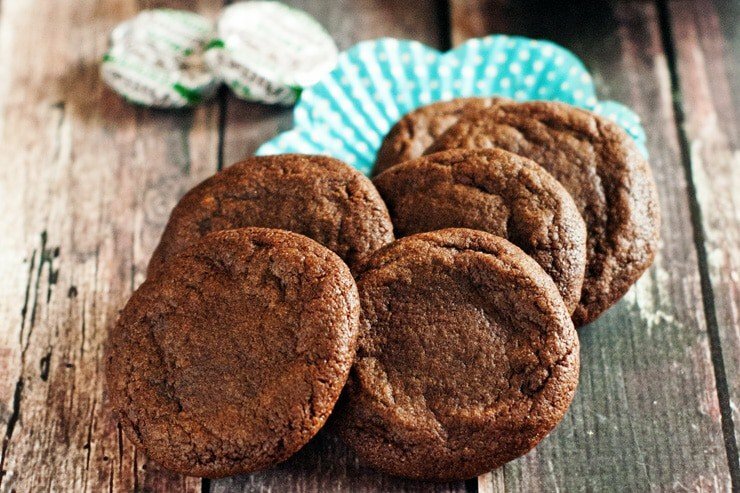 These Peppermint Patty Stuffed Chocolate Cookies are pretty simple to put together and have a pretty big wow factor when bitten into. They are chocolatey and soft and carry a cool layer of peppermint in the middle. So good! Let’s make them! The chocolate cookie dough is pretty straightforward and the directions are in the recipe so I’m skipping ahead. You’ll want to find small peppermint patties to stuff the cookies with. These are what I used and I found mine in the bulk candy section at WINCO. To assemble you’ll scoop your dough out into 2 tbsp portions. I used my cookie scoop to make it easy but a tablespoon works too. Roll your dough into a ball if you didn’t use a scoop and gently flatten into a disk. Place a patty in the middle of each disk. Bring the dough up and around the patty, enclosing it completely and smoothing out the sides and top. Once you do you a couple you’ll get the hang of it and it goes pretty quickly. Place the cookies 2″ apart on a lined baking sheet. These are what I use to bake all my cookies on. They are the best and nothing sticks to them! They’ll bake for about 10-12 minutes but make sure not to over-cook them. The key to keeping these soft is to bake them just until they are barely done. When the 10 minute mark comes, take a look at them and see if the top is still shiny or doughy looking. If it isn’t, take them out of the oven but if they are watch them closely until that doughy look just goes away and take them out of the oven as soon as they look done. 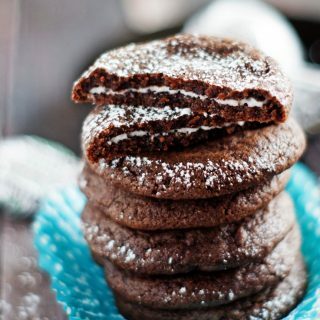 Let the Peppermint Patty Stuffed Chocolate Cookies cool completely and give them a good dusting of powdered sugar if you want. Powdered sugar makes everything look prettier, I think. Another thing I like about these cookies is that they freeze beautifully and taste fresh-baked when defrosted. So get them baked now, throw them into the freezer and pull them out just before your holiday guests get into town in a few weeks (<–what?!?). These Peppermint Patty stuffed chocolate cookies won't last long this holiday season! Who doesn't love a rich chocolate cookie stuffed with a cool peppermint patty? Perfect for dunking in a cold glass of milk or hot cup of cocoa. In a stand mixer, beat butter with sugars until light and smooth. Add eggs and vanilla and mix until smooth. In a separate bowl, whisk flour, cocoa, baking soda, and salt until combined. Slowly add into the butter mixture, beating until just combined and no dry spots remain. Scoop dough into portions of 2 tbsp each. Roll into a ball if needed and flatten gently. 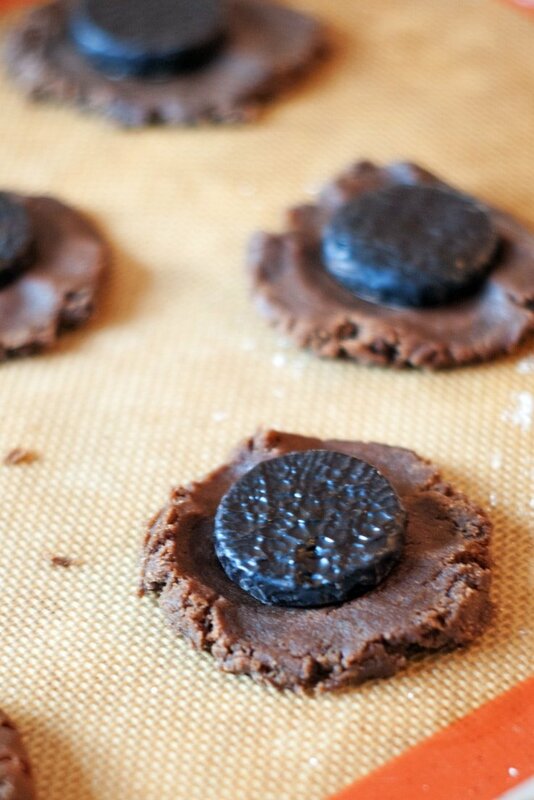 Place an unwrapped peppermint patty in them middle of each flattened mound of dough. 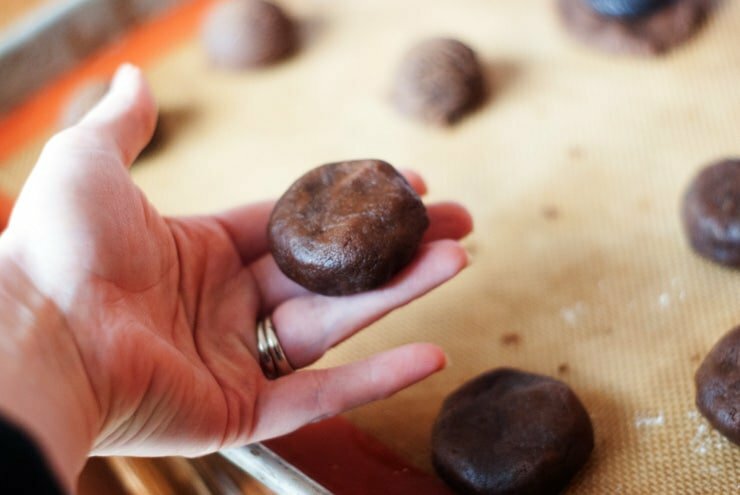 Bring the dough around the peppermint patty until it completely covers the patty, smoothing the tops and edges. Place cookies on a lined baking sheet, 2 inches apart. Bake for 10-12 minutes or until the cookie is just barely set on top. The trick to keeping these cookies soft is to no over-bake them. A set cookie will not look shiny or doughy on top in the very middle. Remove cookies from the oven and cool completely. Dust with powdered sugar if desired. I made these today and they were delicious! I used a variety of peppermint fillings like Bendicks mints and Cadbury peppermint blocks. 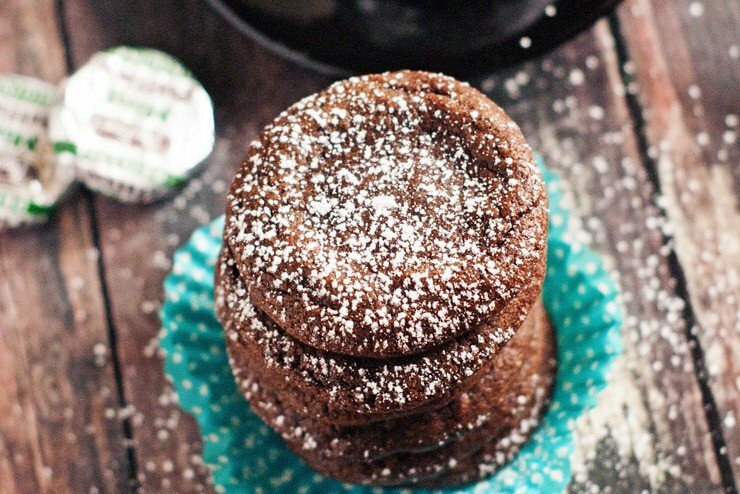 The salt and mint adds a great contrast to the rather sweet chocolate filling. This is an excellent treat for those with a sweet tooth! These look so delicious! Are they chewy?! Looks like this would be a perfect treat to have laying around the holidays!